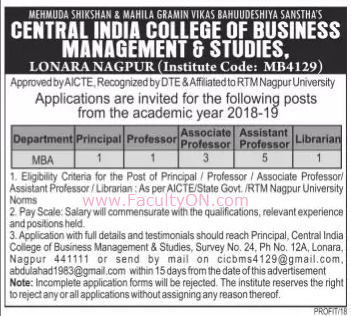 Central India College of Business Management and Studies, Nagpur has advertised in the LOKSATTA newspaper for recruitment of Professor / Associate Professor / Assistant Professor / Principal Plus Librarian jobs vacancies. Interested and eligible job aspirants are requested to apply within 15 days from 23rd August 2018. Check out further more details below. College Profile: Central India College of Business Management & Studies is affiliated to Rashtrasant Tukadoji Maharaj Nagpur University, approved by AICTE. The college offers Master of Business Administration. How to Apply: Interested candidates are requested to send their application on plain paper giving all details along attested copies of certificates and 02 recent PP size photo to the postal address or email address provided below.